Last spring, I attended an informative presentation on Grand Rapids history at the main downtown library. It was about how Grand Rapids and the region were marketed and publicized throughout the Midwest and the country as a travel destination in the early half of the last century. In fact, Grand Rapids was positioned as the “gateway” city to northern Michigan and its rich assets of outdoor attractions. Expertly given by Christine Byron, a retired GR Librarian and a former high school classmate of mine, the presentation also included many golf references which made my ears perk up. Christine and her husband Tom Wilson are well-known collectors of vintage postcards and as such she highlighted her talk with a number of postcards and other images from the era. 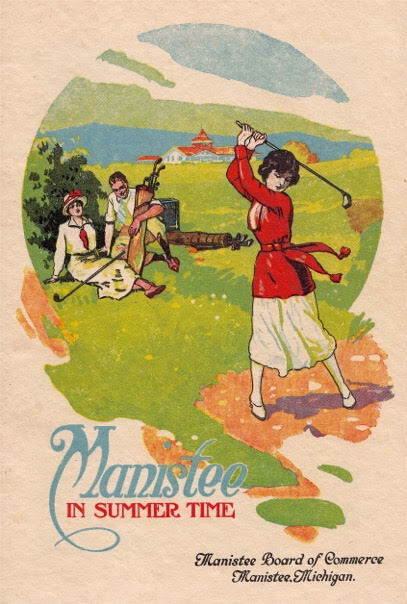 A travel booklet, credited to the Manistee Board of Commerce circa 1920, delightfully depicted three golfers extolling “Manistee in the Summer Time.” Although the woman golfer has a backswing longer than John Daley in his prime, I love how she’s fully coiled (and coiffed!) behind the ball. Also noted in the background, is the clubhouse of Manistee Golf and Country Club. It opened in 1901. What intrigued me most was how golf was an important part of the area’s tourism message. One brochure from 1926 listed a long roster of public and private golf courses “available to all tourists.” The list went from St. Joseph in the south to Mackinac Island in the north. On the public or “open to all” side, 45 courses were cited with number of holes and yardage. The most exotic sounding course was the Coryell Islands Golf Course which I had to use Google maps to locate. Its locale is northwest of Mackinac Island in Lake Huron and not far from the town of Cedarville in the U.P. Alas, it’s no longer in existence. 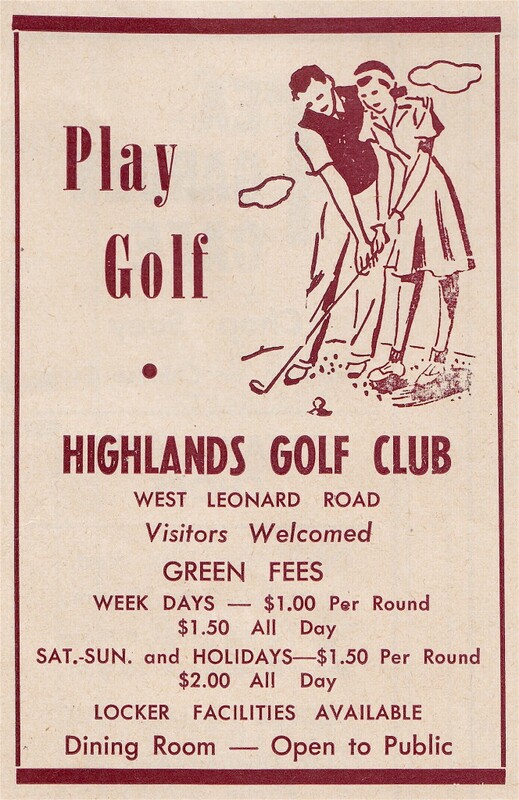 Another brochure, from 1948, encouraged visitors to “Play Golf” at Highlands GC in Grand Rapids. Greens fees were $1.00 per round and $1.50 all day for weekdays and a half buck more for weekends. (Darn, no senior rates!) At today’s equivalent dollar values, those fees are $10.54 weekdays and $15.80 weekends. Other courses seen and mentioned in the presentation were Indian Trails GC in Grand Rapids, White Lake GC in Whitehall, Northport Point GC in Northport, and Petoskey and Bay View CC in Petoskey. All in all, the presentation was an enjoyable trip back in time. 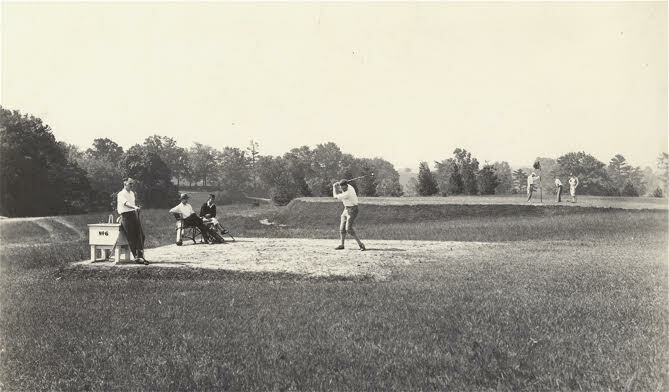 As much as one might like to think the Pure Michigan campaign initiated efforts to entice out-of-state golfers and travelers to visit Michigan, vintage postcards and historical photos prove the impetus started a long, long time ago. Images courtesy of Christine Byron and the City of Grand Rapids Archives.